Bookmarklets are java-scripts that executes only when you want. Unlike browser extensions, they do not keep running in the background. They are better than extensions all the time. 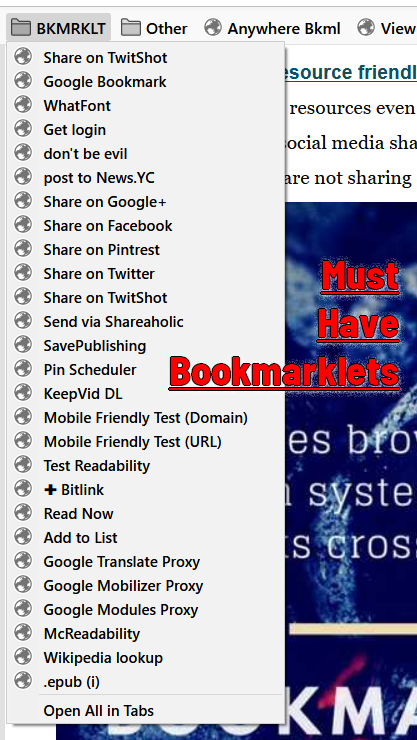 Bookmarklets are universal and same bookmarklet work across all the browsers. Bookmarklets are system resource friendly. How? Extensions keep using system resources even though you are not using them. For example, extensions like social media sharing services, keep running in the background even though you are not sharing any web page. Irrespective of a platform like Windows, Linux or even mobile OS like Android or iOS. Here is a collection of bookmarklets that you can replace for an extension. Easily save any URL to Google bookmark. You can also edit the labels and add notes to bookmark. If you are sharing your life more on Google Plus, this will make your task easy. It gives you a one-click way to share anything on Google Plus without leaving your current web page. 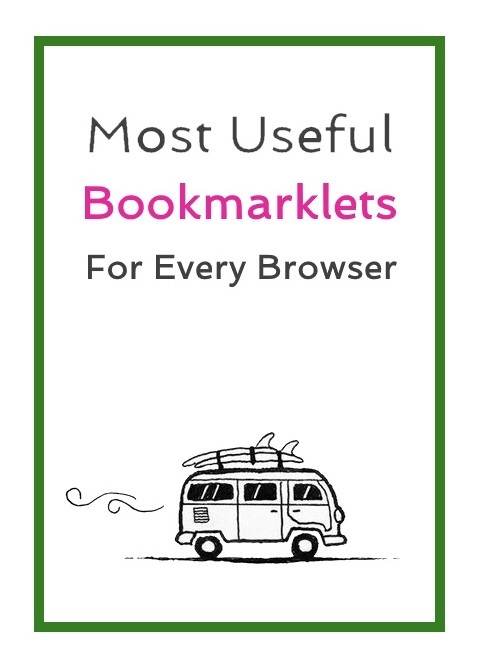 Link or drag this Bookmarklet to your bookmark toolbar. Share the current web page to Twitter. As tweets with images get more interaction, Twitshot allows you to share any link to Twitter and add an appropriate image from the same web page that will attract more followers. Share webpages to StumbleUpon social bookmarking site. Pin the current web page to the Pinterest social bookmarking site. Link official developer page or direct bookmarklet. Easily find out which font is used on any web page you are browsing. The font size and line spacing and more information about the typography of any web page. Do you want to type in any language other than English? This Google Transliteration bookmarklet will easily enable the Google Transliteration service in your browser for easy local language typing on any website. Languages supported are Amharic, Arabic, Bengali, Greek, Gujarati, Hindi, Kannada, Malayalam, Marathi, Nepali, Persian, Punjabi, Russian, Sanskrit, Serbian, Tamil, Telugu, Tigrinya and Urdu. Go to this google Link and drag respective language bookmakrlet. Though Chrome automatically translates web page with Google Translate, you can use Bing Translate on Mozilla Firefox and other browsers. Link or Drag the Bookmarklet (For English) For other languages, go to the web page and select your language. Let you save/download videos from YouTube and other streaming websites. It converts the YouTube video link to a downloadable video file link. No need to install any extra software. It removes the unwanted part of a web page like ads, signatures, logos and any unwanted matter before you print the web page. You can either download as PDF or sent the page to your email address. Bookmarklet with some simple tools to makes websites print better. One click to activate, and then click to remove elements like graphics, and apply better print styling. You can rearrange page items. It can download any web file directly to your Dropbox account. No need to download locally and then upload to Dropbox. Its like file from one Google Drive account is saved to other Google Drive account. All these three bookmarklets give you a shared user ID and password for websites like forums, file sharing services, and any other sites. Sometimes you need to create an account to some forum or website just for single use. You don't have to create a new one and give an email address, this will help you. Now, Google giving special credits to responsive and mobile friendly websites. You can test if your website/blog is mobile friendly. Are your browsers cluttered with too many extensions? Make it slim and fast. Even if your system is too powerful and you simply don't worry about system resource, still you can save this bookmarklet to use on mobile devices. URL shortening service Bit.ly do have an extension, but it also has a bookmarklet to make long and ugly URL to a short and simple. Convert any web page into an ePUB formatted ebook for reading on ebook reader devices or applications. If activate Firefox browsers' native spell checker on any page you are viewing. You can try it on this page also. Select any text string on the web page and hit this bookmarklet. It will automatically open the Wikipedia page with the selected text as a query. View the cookies on set by any website with one click. Drag this bookmarklet to your bookmark bar.